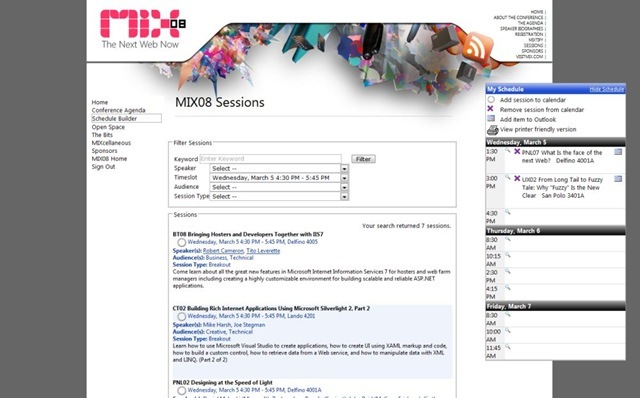 Within a week we’ll be on our way to Vegas again for the MIX08 conference. I quite enjoyed last year’s MIX conference with the announcements of Silverlight and Expression Studio, but also for presentations such as Lou Carbone’s for instance (who will be back this year by the way). What I like about this year’s agenda as well is that there will be a bit more presentations and workshops that aren’t all 100% tech, as that was probably my only wish after last year. With people like Steve Ballmer, Lou Carbone, Guy Kawasaki, David Armano and obviously also Hugh MacLeod and Loic Le Meur (and many others) it looks indeed like that is happening. Anyway, a lot of presentations these 3 days so to make sure I don’t miss anything, I’ve fired up the schedule builder on the MIX website to make sure I scheduled everything I wanted to see (and added that to my Outlook which is an option within ‘my schedule’). Small note on the schedule builder, you need to be registered for the event to be able to use it. And unfortunately, if you aren’t registered already, the event is sold out since last week. So if you’re going to MIX as well (and you’re reading this blog) then let me know so we can connect in Vegas (maybe in the Blogzone). I guess that relates immediately to the one big thing I’m missing on the MIX website and that’s the social element. Now I’m not waiting for the next social network, but since I’ve got a login after registration anyway, it would have been nice to be able to use that some more. Who do I know that is going? Which sessions are they going to? It’s like adding a bit of LIFT08 to MIX08 :) That said, it was interesting and fun last year, I’m sure it’ll be so again this year. Are you taking your Xbox360?